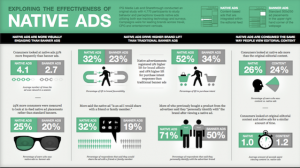 What is native advertising and how it differs from sponsored content? The two terms “sponsored content” and “native advertising” are often misused by people, sometimes they are even used interchangeably. But actually they are actually two different terms. Both native advertising and sponsored content are paid forms of content. Both native ads and sponsored content are part of content marketing. As can be concluded from the name, native advertising contains some promotional elements; hence advertising itself has to convince somebody to do something rather than to provide some information. Though at first sight it may look like an ordinary article, but it can subconsciously drive to an action or contain some promotional data about a company or a business. Native advertisements are a kind of newspaper advertorials for the digital age. The primary forms of sponsored content were advertorials and paid posts on blog websites. In time sponsored content: on the contrary, sponsored content is not focused on convincing or advertising; it is rather aimed to informing. There are certain limitations on the sponsored content but benefits are also temporary. The sale and delivery of online advertising, the systems and procedures designed for their implementation are what ad operation revolves around. Connect with our best ad operations professionals and enthusiasts all over the globe, discuss the question you have, get the advice you need and improve the performance of your online business boosting your revenue and chances in the virtual world of life-changing opportunities.